NON-FERROUS METAL, BRIGHT COLORS Easily detected by visual and automated inspection. SELF-ADJUSTING POLYURETHANE FOAM Expands to fit virtually any wearer. NON-FERROUS METAL, BRIGHT COLORS Easily detected by visual and automated inspection. SELF-ADJUSTING POLYURETHANE FOAM Expands to fit virtually any wearer. 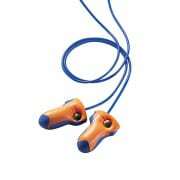 Laser Trak offers high visual and metal detectability in a Single-Use earplug. Laser Trak’s low-pressure foam expands gently inside the ear canal for comfortable long-term wear, while it’s contoured T-shape delivers easy handling. A metal grommet on the earplug aids in metal detection, especially in process industries. Laser Trak offers high visual and metal detectability in a Single-Use earplug. Laser Trak’s low-pressure foam expands gently inside the ear canal for comfortable long-term wear, while it’s contoured T-shape delivers easy handling. A metal grommet on the earplug aids in metal detection, especially in process industries.